After the first leg in Pune, we were all looking forward to the Delhi event with a bated breath. My city was going to host one of the biggest sneaker events in its history and I was going to be a part of it. It was exciting and even though we all had a vague idea about what to expect, there were still quite a few things left to the imagination. Homegrown events was trying to do it big. 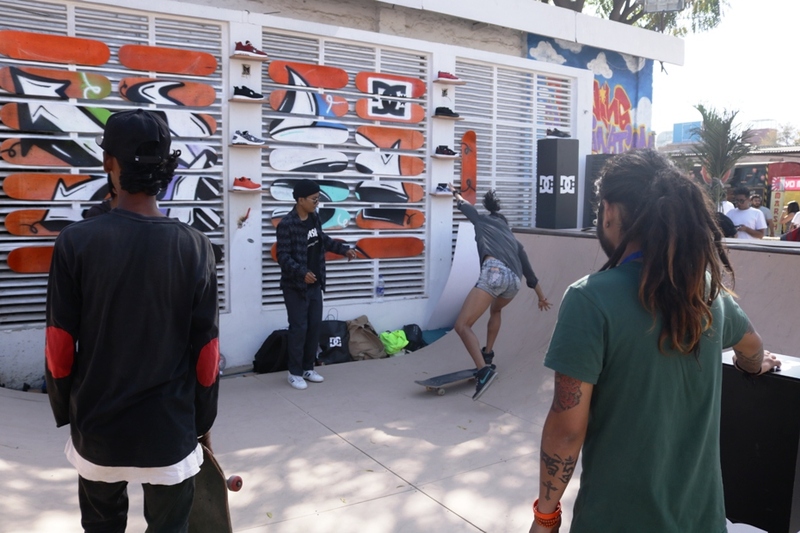 So unlike Pune where it was just Puma India and Sneaker Pimps, multiple brands were to set-up booths at Dhanmill Compound in Chattarpur, New Delhi and offer their own unique experiences. 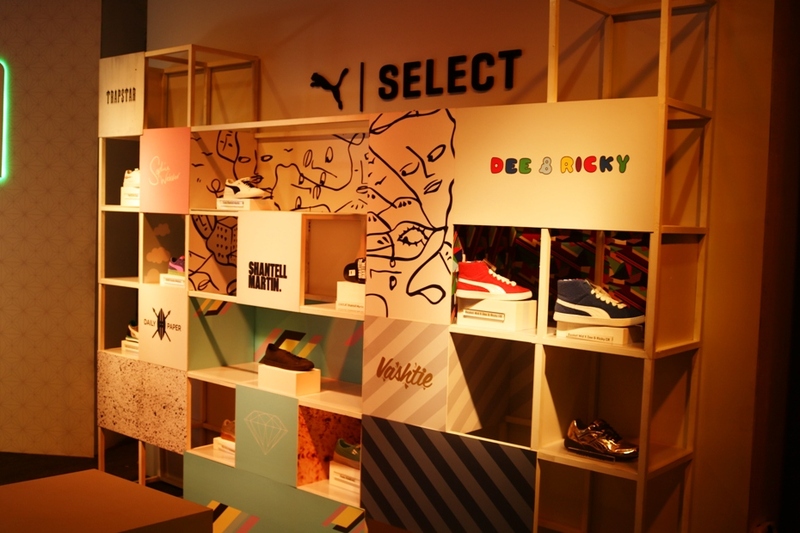 Not only that, several brands were given dedicated spaces to set up shop and show-off their inventory. It was a great networking opportunity for them as well as a dipstick check of who was doing what. As I walked in, I was greeted by a few familiar faces. A few daps later, I headed straight for the PUMA x Sneaker Pimps booth. The entire Delhi Gang was there and the racks holding the kicks were already in place. The leaping cougar was on the wall in neon green and the 50 years of Suede set-up was a notch above what I had already witnessed in Pune. The stage was set for another day of sneakers, music and good times. After greeting the PR and Puma contacts, I was back to what I always do – scouting the whole venue and checking people’s feet. The place was teeming with people but I knew the real crowd would hit the compound after sundown. It was therefore time to check out every booth, shake some hands, have some conversations and click away. It was amazing to see what all the people behind these brands were up to with all their unique offerings under the Shopify umbrella. Capsul showcased a bunch of apparel from hard to find brands in India like Stussy, The Hundreds, XLarge, Carhartt, among others. They also brought out the super dope Russia Exclusive Puma x Soyuzmultfilm Suedes which were probably one of the highlights of the day for me. Getting to see some Soviet Cartoons on top a silhouette that has just completed 50 years and that too in hand? Yep, they were quite something. Nixon Bui was impressive and I was quite amused to know how a guy from Arunachal managed to break into the Danish fashion scene. Shia Rai was the next one that impressed me as I had been looking for something clean and minimalist. The colors they had on display were just what I was looking for but not exactly in the same dimensions. Dcyphr’s display was quite interesting with a plethora of styles including lace-ups and slip-ons. The construction felt nice and the kicks felt great in-hand. The color palette was nice across the display and some of the sneakers were bold. All in all, this was one of the most interesting halls at the venue. Since I had more to look at, I moved along. One of my favorite skate brands had a small wooden skating pit installed to the left side of the entrance so it made sense to start from there. It wasn’t a surprise to see how far DC had come as a skating brand in India. However, I was amazed at the number of people that had adopted it. Also on display were a few of their low-tops including the heathrow, crisis and cole lites. While I would have loved some of the old school silhouettes like the court graffik & CG SE, the Cyrcle collab or the spartans, this was just perfect for now. They did not go overboard and had quite a few colorful graffitis surrounding them much to the pleasure of the onlookers. They were set-up out in the open as they should have been with majority of the younger crowd watching some nice moves in the pit. Smack in the middle of the venue was the brand with the three stripes, diagonally opposite to Nike’s space (wink). 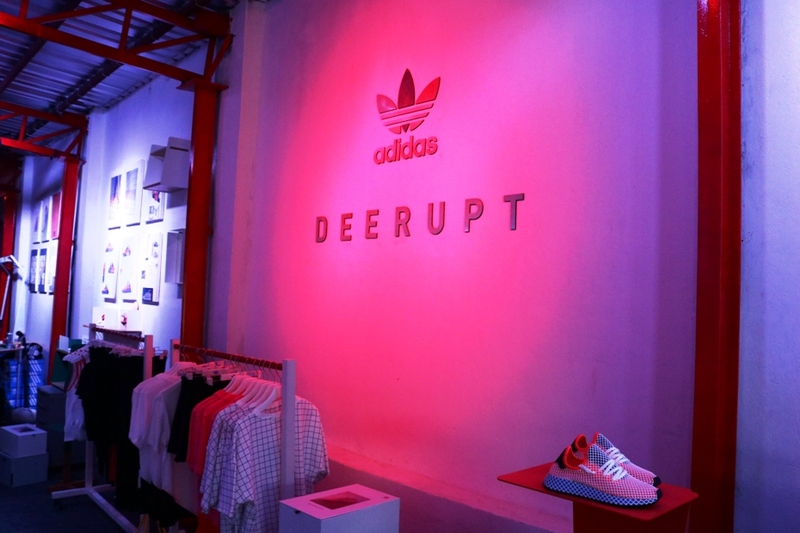 It was large, colorful, well organized but aimed purposefully towards its latest launch – The Deerupt. Adidas has an inventory that can slap you into oblivion but for some reason, most of it wasn’t out and about. To the right hand side, you could see the Deerupt section with apparel and an entire storyboard along with a bunch of racks displaying the different colorways. 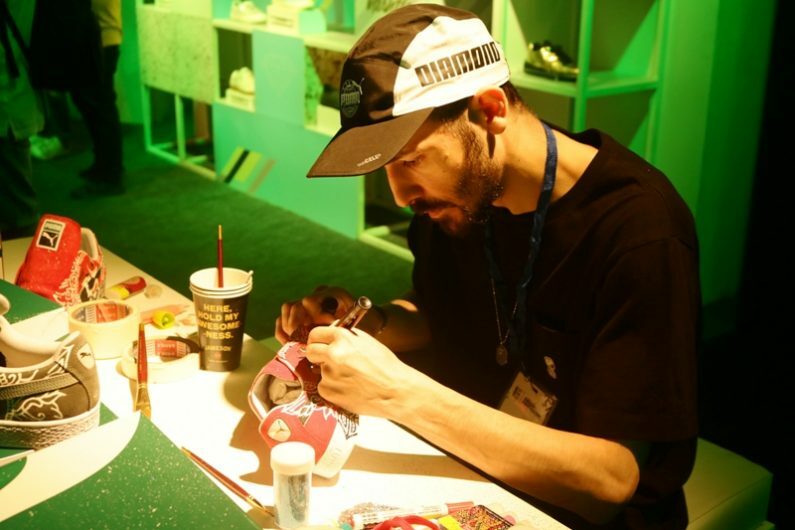 In the middle of the booth were some of the brands recent popular collabs with Pharrell Williams, Bape, etc. From an objective eye, I was happy to see that they were thinking along the right direction but as huge as the hall was, it could have been filled up with some of their older silhouettes in their OG form or their boost avatars. Samba, Iniki (aka I-5923), Busenitz, Superstars, Gazelle, Ultrastars, Forum, Campus, ZX Vulc, ZX Flux and 8 million more shoes could have made the cut but it seemed to be a Deerupt themed affair from start to finish. Towards the end, they raffled out some of the coveted pairs and it was great to see the enthusiasm among the ones who knew as well as the ones who were just getting a hang of things. Focused campaigns are good to have but a thematic compartmentalised approach while presenting the bigger scheme of things feels much better, specifically when you are opening doors to an audience that is to be made aware first. Nike is no slouch when it comes to inventory and successful models that people recognize within the first glance. The Air Max 270 was their hottest bun out of the oven and the entire booth was themed around the same. The exterior was blessed by the talented Dizy One and inside the booth by Nishant Fogaat. His workshop consisted of Kits arranged according to difficulty levels and people learning how to put some Air Max stuff together based on the difficulty levels they chose. This was a good initiative from Nike and a great interactive exercise to be a part of, from the eyes of someone new to the sneaker scene. It added a wholesome experience in a unique way by people getting to actually “touch” and understand the shoe. But all in all, there is indeed a learning for Nike India here – there was nothing that presented the legacy of the brand or showcased its history to someone absolutely new walking in. 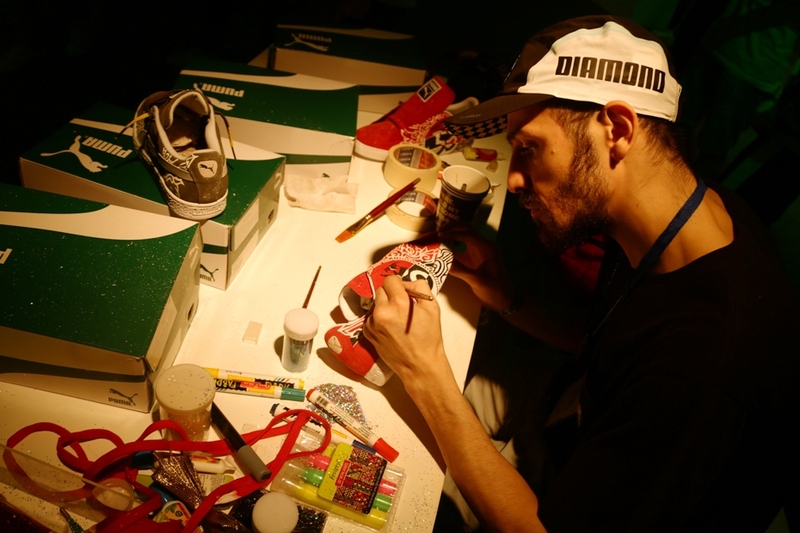 After a fun photoshoot, looking around and ingesting some iced coffee, I returned to the PUMA hall to witness the legendary Russian Sneaker customizer Maggigad turn some Puma suedes into pieces of art, thanks to his unique paint-job on each shoe. It was truly a sight to behold and surprising how he could just totally immerse himself into his art. 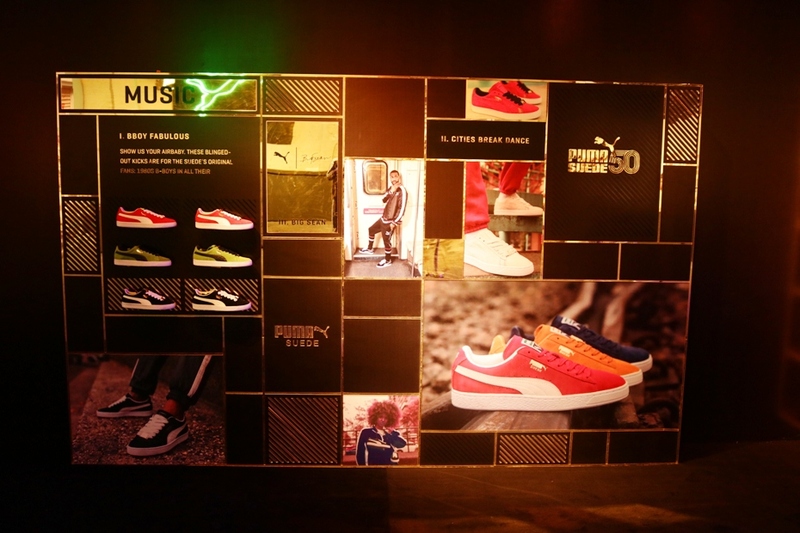 Soon after this healthy doze of art, Yassine Saidi – Global Head, Puma Select took the stage and walked everyone in attendance through the blueprint PUMA laid out for itself and then followed. Since it was about the blogging/influencer space along with powerful brand names which were mostly celebs, it was a great informative session on how Puma did it and continues to do it. This was followed by another magical session by Leonard Hilton McGurr aka Futura/Futura 2000 who just like in Pune, did a live art piece just outside the PUMA hall as Delhi watched in awe. He then took some time to autograph some stuff for people and then slipped away. By this time, the music had become louder in the PUMA hall with performances from Prabhdeep and Raja Kumari attracting a big crowd. It was a long day for everyone and I decided to sip down another iced coffee before heading home. After saying my goodbyes, I decided to get a nice long walk in before hopping into a cab. Events like these are the need of the hour. While the scene is still in its infancy, the germination has begun. These baby steps will decide how we fare in the long run and will probably attract more brands to open up shop here in the capital. There are plenty of other things I haven’t told you yet but they are best left to your imagination.